Bernie Sanders just endorsed Hillary Clinton for the 2016 Presidential candidate. From now on, Hillary Clinton and Donald Trump are the two main candidates for the 2016 US Presidential Election. But what does a President Trump or Clinton mean for the US’ relations with Japan and Korea? 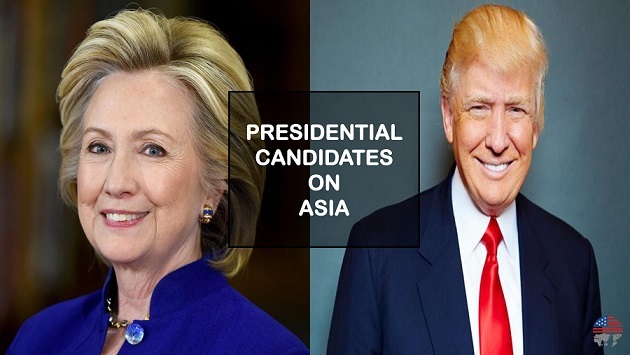 Our intern Seowon Lee researched and summarized what those two candidates have said so far on Asia. You can enjoy it by clicking here. Hope you all enjoy the post and find it interesting! 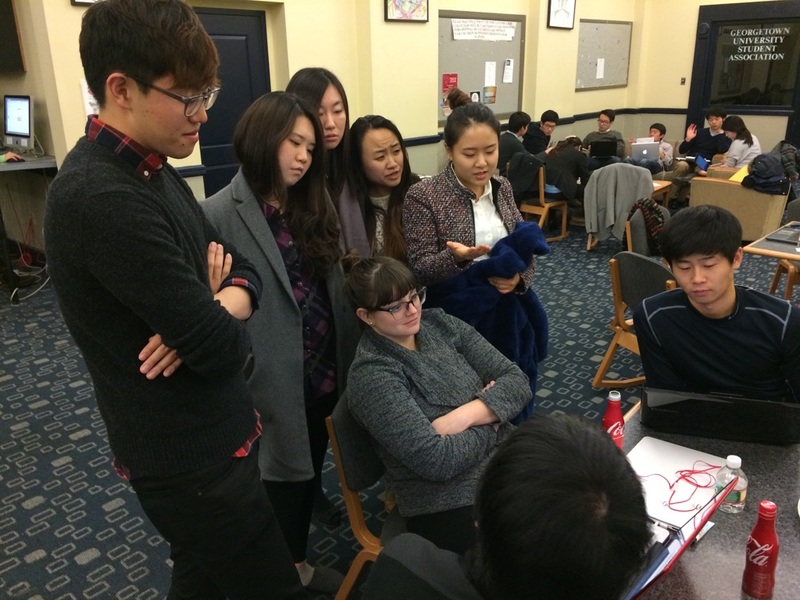 Seowon Lee is currently an intern at International Student Conference. She is also a student at Hankuk University of Foreign Studies (HUFS). The cherry blossoms in Washington, D.C. are in full bloom now, and the National Cherry Blossom Festival (March 20­ April 17, 2016), a month­-long celebration of spring in the nation’s capital, has just begun! International Student Conferences (ISC) staff visited the tidal basin on March 22, 2016 to enjoy the beautiful flowers which have become a hallmark of spring in the DC metro area. Did you know that the Washington, D.C. cherry trees and Japan-­America Student Conference (JASC) share a mission in common? As many may already know, Washington’s renowned sakura trees were a gift of friendship from the city of Tokyo in 1912. Since the initial arrival of the 3,000 trees, every spring, the cherry blossoms have served as an enduring symbol of friendship between the United States and Japan, warming people’s hearts and bringing together families, friends, and communities in celebration of Japanese culture and the beginnings of spring. It is only due to the lasting friendship between the US and Japan that we can continue to enjoy the cherry blossoms today after nearly a century. During World War II, the Cherry Blossom Festival was suspended, and after the Pearl Harbor attack, several trees were cut down in what was believed to be an act of retaliation. However, visitors still flocked to enjoy the blossoms, even during wartime. Over the years, more gifts of trees have been exchanged between the two countries, including the gift of dogwood trees from the US Government to Japan, and additional cherry tree gifts from Japan to the US, reaffirming the friendship bonds between the two countries. One of the key missions of JASC is to foster lasting friendships between the US and Japan, both at the personal and national level. We hope that our annual conference, just like the Washington, D.C. cherry blossoms, will be a time of year when people from the two countries come together to celebrate the enduring friendship and build new interpersonal connections that will continue throughout their lifetime. We also want JASC to be a signature experience that people working in US­-Japan relations will look back at fondly for years to come as they move forward in their respective careers. 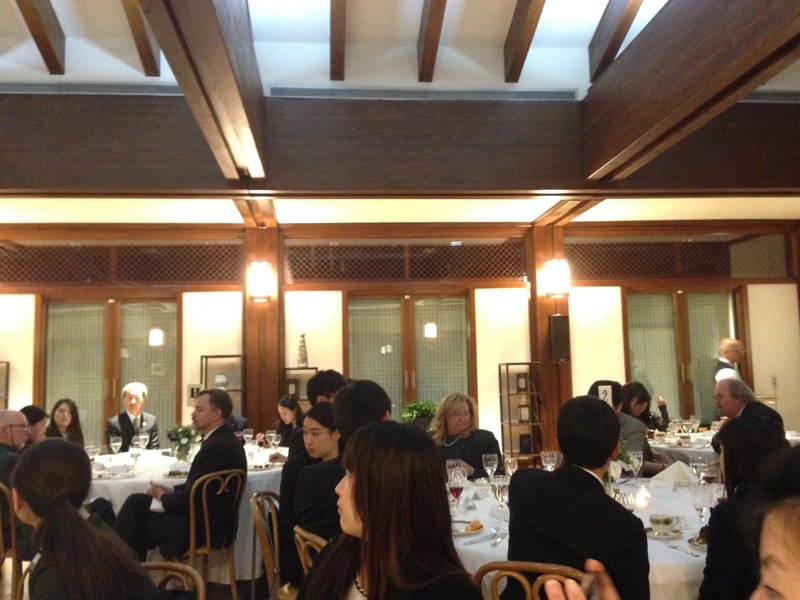 We went to the Japaneses Embassy for a luncheon with the Minister for Public Affairs, Masato Otaka. 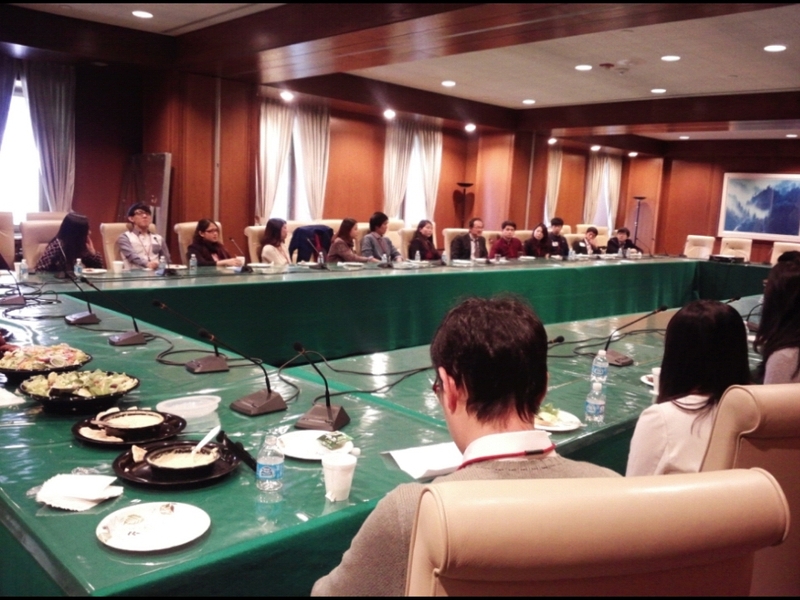 KASC and JASC ECs had a wonderful discussion on Korea-US- Japan relations based on our trilateral symposium round table topics (Immigration, Urban Future, and Security Alliances.) The Minister was so helpful and he let the conversation very well. He was willing to listen to us as student leaders and we also paid attention to what he said. It was so great time. I had a hard time transforming into words the feelings we went through over the past couple of days. On the last night of our journey, we finally found time to sit down and calmly go over what we’ve done throughout Trilateral Symposium. Our reflection was hard to describe in just a few words. There were unexplainable tears, laughter, regrets, irresistible passion and mostly thankfulness. 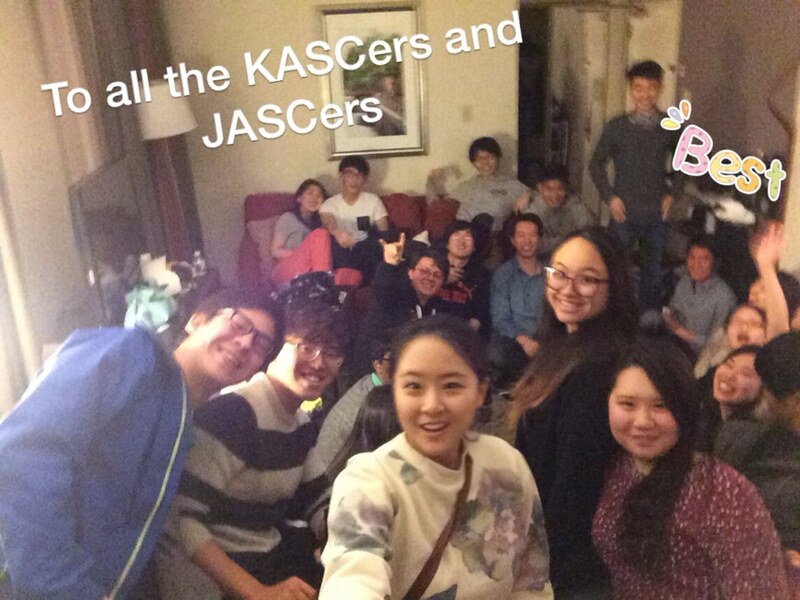 First, I would like to thank JASCers who welcomed us warmly. The conference was only for three days. We didn’t have enough time to know each other in a personal manner. Even so, I believe we all felt the same thing. We were strangers, yet not strangers because KASC ECs were another version of JASC ECs. We didn’t know each other but at the same time we knew each other in a sense there was no wall between us from the start. We were eager to know more about each other. We were different, yet the same in the sense that we had the same goal of improving our own conference, knowing the responsibility of being leaders and having the passion to devote ourselves fully in the roundtable discussions. The mindset that we are accepting our differences as they are by sharing the common grounds as being the leader of each community made us overcome time constraints, the possibility of lacking emotional exchange on personal level and mostly different perspectives on our roundtable topics. So thank you to all the JASCers for having receptive attitude and letting us feel immediate bonding even within three days. Secondly, thank you to all the KASC ECs. We all know these past few months have been a downhill road for us. We were getting tired, losing our passion and radiant expectations we had at the start of our journey. I now know how important it is to be next to those who are running with me when they need me, so thank you to everyone for keeping up even though it must have been hard for all of you to keep only yourselves up. And thank you to those who pushed themselves through to break their personal limits. I would like to especially recognize one of our Korean Executive Committee members, Soyoung, who was an introvert during our summer conference. I never saw her speak in front of an audience. However, in this conference, she has given us courage and another motivation by throwing herself wholly into most of the lectures and networking times. Finally, I would like to express my utmost appreciation to all the people who worked behind the scenes to make Trilateral Symposium successful. All the supporters of KASC and JASC, including panelists, lecturers, our board of directors, and sponsors—thank you so much for providing this wonderful experience. Also, Minjun, Chelsea and especially Yuuki—thank you for molding this experience into memories that we will keep for the rest of our KASC journey. I believe Trilateral Symposium will be remembered as a crucial turning point for KASC as a new-born program. We drew out the model for KASC, recharged our motivation for the next half of our marathon, broke through personal limits as leaders of the next KASC and, mostly, felt from bottom of our heart the mission of ISC to promote peace by furthering mutual understanding, friendship and trust through international student interchange. There’s no other way to describe my week with the Japan-America Student Conference (JASC) and Korea-America Student Conference (KASC) Executive Committee members (ECs). 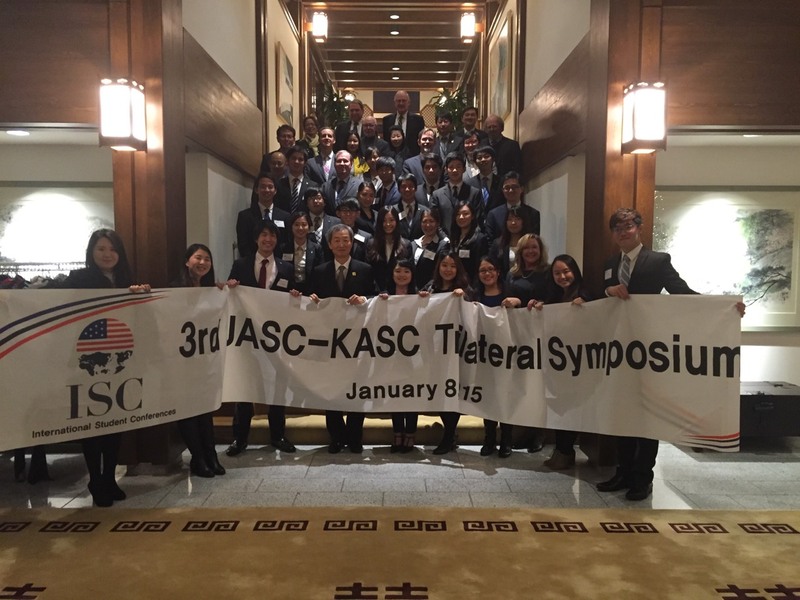 From forging new connections, learning about and from each other, and sharing best practices for our respective conferences, the JASC-KASC Trilateral Symposium was a once-in-a-lifetime opportunity that we are eternally grateful for. 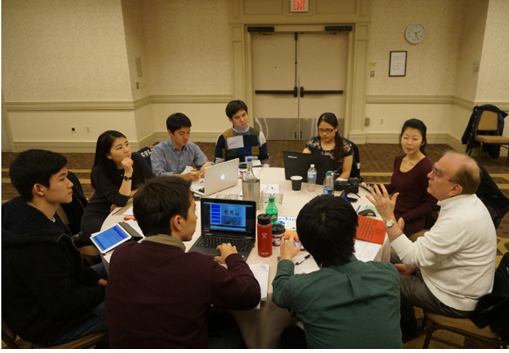 As most of my colleagues have already posted about, Trilateral Symposium was a chance for the JASC and KASC ECs to break up into mixed groups, discuss issues relevant to our roundtable (RT) topic, and collaboratively create and present a 20 minute presentation for a panel of experts. My RT, Urban Future and Its Challenges, was especially challenging; most of us came into the Symposium with little knowledge and expertise on urbanization and urban issues. On Monday, Jan. 5, International Student Conferences (ISC) invited Dr. Bertrand Renaud, an expert on financial and urban development and real estate finance, to speak with us regarding our RT. Although a lot of information was packed into the hour-and-a-half meeting, everyone in the Urban Future RT was very impressed by Dr. Renaud’s remarks and feedback. We subsequently incorporated what we learned into our Trilateral Symposium presentation, which received positive feedback from the panel of experts and audience members. Without a doubt, I can definitely say that Dr. Renaud and the Urban Future RT inspired me to learn more about urban cities not only in Japan, Korea, and the U.S., but also around the world. I want to continue what we started at Trilateral Symposium and learn more in order to hopefully move the world and create a better future. I would like to thank ISC, including Yuuki Shinomiya, Minjun Chen, and Chelsea Irvin, for the extremely well-organized conference. All of the JASC and KASC ECs left Trilateral Symposium feeling very empowered and grateful for an amazing and unforgettable experience. Special thanks as well to Trilateral Symposium sponsors, donors, lecturers, and supporters; the Symposium wouldn’t have happened without you! Finally, thank you to my colleagues, the JASC and KASC ECs, for continuing to serve as role models and inspiration to me (even though I am older than most of you all!). I can’t wait to continue working with you all in the future! It has been 2 days since JASC and KASC executive committee members met to start Trilateral Symposium. Today, my roundtable, Security Alliance and Historical Controversies, picked the best topic among the 5 topics related that we have discussed since arriving at Georgetown University. Even though we read many articles about the U.S., ROK, and Japan relations before coming to Washington D.C, it was hard to choose a specific topic that we can work together equality. We decided choosing topic that how and what we are going to focus of for three countries in the future and how to harmonize between three countries. Frank Jannuzi, CEO of Mansfield Foundation, came and gave us a lecture today about U.S. foreign policy in East-Asia. He has a lot of experienced in East-Asia policy. Jannuzi is an international affairs political expert who served under Chairman John Kerry as Policy Director for East Asian and Pacific Affairs for the Democratic staff of the United States Senate Committee on Foreign Relations. Through Jannuzi insight, our roundtable gain some ideas on our topic, what to research, consider security alliance and policy, and the economy structure. During roundtable, professor Nishino Junya and Professor Andrew Oros, who specialize in relations between the U.S, Japan and Korea, joined our roundtable and shared their thoughts on our roundtable’s topic. I appreciated the professors for coming in during our roundtable to share their knowledge and for being panelists at final forum. In the evening we were invited to Republic of Korea Ambassador’s Residence. It was great honor to meet Ambassador Ahn and the ISC board members. 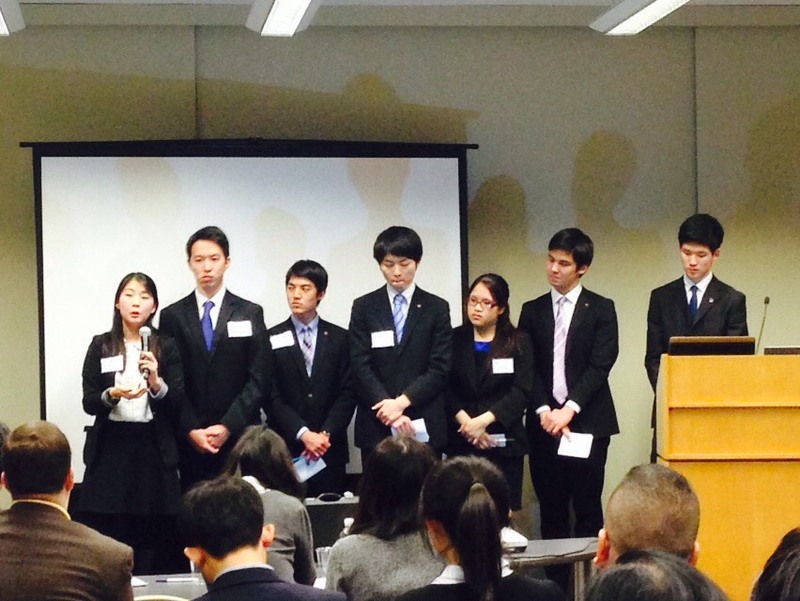 I am very thankful to meet with student leaders from Korea, Japan, and the United States at symposium. They were all amazing students and I learned so much from them. It was great getting to know each other. The first day of the trilateral symposium reminded me of the 7th Korea-America Student Conference last summer. However, it was much more cohesive and fulfilling experience in terms of academic and professional growth. Starting with a brief self-introduction game, which helped us break the ice, we had a highly informative lecture on leadership from Lieutenant Dianna Dietrich, U.S. Navy. Especially, her professional advice on peer leadership suggested us, who work with peers to run a month-long student conference, practical guideline for how to reduce unproductive and unprofessional behaviors and improve the working environment. After her impressive lecture, we had roundtable discussion and a special speaker, Dr. Bertrand Renaud from International Consultant was invited to Urban Challenges and Its Future Roundtable discussion. Even though the official schedule was over at 6pm, each roundtable continued their roundtable discussion enthusiastically and proactively, thinking about what the roles of Korea, Japan, and the United States were and how the trilateral relationship could help solve problems regarding their roundtable topics. Trilateral Symposium came and went unapologetically, leaving us ECs exhausted and consumed with the weight of our positions as student leaders. But more importantly, Trilateral Symposium left us reflective. Thursday morning began sharply at 6:30 AM with bagels, cream cheese, and no time for complaints. We were hauled by Uber to the Carnegie Endowment for International Peace, where the culmination of our week was being held. Presentations were still being memorized, speeches were being written, and it was a criminal 12 degrees Fahrenheit in DC. We successfully went through a month’s worth of research and hard work within three to four days, and suddenly last July seemed so long ago. Transitioning from delegate to EC has been a process—an admittedly long and strenuous one. But the level of confidence and leadership I saw in that single day was once unfathomable to me. I still remember my first conversation with 8th KASC American Executive Chair, Tiffany Xiong, back in late June. We were waiting together with other 7th KASCers on our first day of American Orientation. Our ECs were stuck in LA traffic, and I was senselessly hoping I still remembered which social formula to use when making friends. Yet here we are, almost half a year later, changed people with new close friends. I’m inexplicably proud of how we’ve grown together within this time as KASC ECs and within this one week with the JASC ECs. Trilateral symposium, like our upcoming summer conferences, was only possible because it was supported by a unit. So I’d like to share thank-yous to our panelists, lecturers, and special guests, to our board of directors and sponsors, to all of the JASC and KASC ECs, to Mijun, Chelsea, and most especially, to Yuuki. Thank you for being a part of this week. It has been a pleasure. Good luck this summer, everyone! Hi my name is Luis Montaño Michel, one of the eight JEC members for the 67th Japan and America Student Conference, part of the Historical Issue & Security Alliance Roundtable. Today we spent most of our time preparing for the roundtable presentations, which will be held tomorrow. When I was a delegate of the 66th JASC we had almost one month to discuss and prepare for the final presentation, but now we have only days. We need to do the whole process within three days, and efficiency is required in the whole process. Honestly, I was anxious about how I can commit to my roundtable, because I am neither good at historical issues nor security alliances. In addition, my English is really bad. I wish I could write the blog post in Japanese. However, we are now well prepared thanks to the cooperation of the RT members. I was impressed that we were able to include everyone’s opinion in the power points, without rejecting anyone’s opinion. Of course we had to choose which topics we should discuss and which opinions we need to present to the audience, but the most important part was that we could manage our discussions in a democratic way. I believe that we can achieve more by having discussions democratically rather than in a dictatorial way. I am very glad to see that democracy still works in Washington D.C. I won’t lie, Trilateral Symposium has been a little surreal. 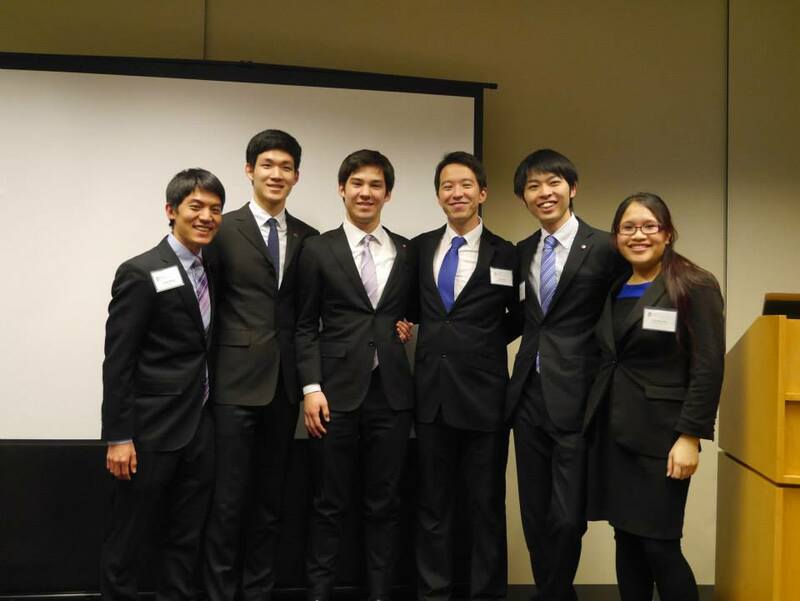 It’s been around five months since the end of the 66th Japan America Student Conference in Washington D.C. It was stuffy in August when we had said our tearful goodbyes to one another. But then just in the blink of an eye, we are back reunited joyfully in D.C. The sun is bright, reflecting off the fresh snow and chilly to the bone. It is surreal to be in a round table again discussing other captivating diverting issues again about US-Japan-Korea relations. It allowed me to realize that this is the last time I would be acting in the delegate capacity and to really enjoy it. Today the Urban Futures and its Challenges roundtable made a lot of headway finalizing the broad theme of our topic. We delved deeply into the idea of the city, and who it is for. Is it for the residents? Is it for the companies? Is it for the tourists? In addition to these almost philosophical questions, the delegates from both conference have shared their own personal experiences as city dwellers from cities all over the world. After much RT discussion, Frank Jannuzzi, President of the Mansfield Foundation came to visit us for lunch and gave an amazing lecture on US foreign policy in Asia. Mr. Jannuzzi is an extremely thoughtful, personable, and dynamic speaker. I was really blown away by his depth of knowledge but even more so by his frankness in discussing these matters with us. In the evening, we made our way to the Korean ambassador’s residence in Washington D.C. The ambassador made us feel right at home with his warm comments and easy going attitude. At the dinner I was fortunate enough to have a range of conversations with different individuals such as Paul Yoon from the Council of Korean Americans to Retired Ambassador Hubbard. All these amazing events made me extremely grateful to be a part of the JASC community and extremely excited to lead the 67th Japan America Student Conference next August.